FCI Recruitment 2019: Food Corporation of India popularly known as FCI issued the recruitment notification for a large number of vacancies. FCI Recruitment 2019 for 4103 posts for Northern region, Western region, Eastern region, Southern region, and North-eastern zone has been released. Candidates belong to these regions and having the eligibility as per the announcement can apply for FCI posts through online at fci.gov.in. The application process will be starting from 23rd February and the last date to apply for FCI posts is 30th March 2019. Hence applicants can hurry up to apply FCI posts 2019 within the announced dates. Candidates were interested to check more details such as educational qualification, selection process, application process, and other details from the following article. Food Corporation of India (FCI) is the state government organization that monitors various works. The organization annually announces various recruitment notifications depending on the requirement. This year the FCI announced 4103 various posts hugely for various locations across India. Candidates interested to apply for FCI jobs can proceed to apply for the announced posts. Candidates have to possess the educational qualification as per the designation. And the age limit of applicants must be in between 18 to 40 years. Age relaxation for reserved category candidates will be offered as per norms. Freshers and experienced candidates can also apply for FCI posts. Selection of candidates will be done through preliminary examination, mains examination, and interview rounds. Selected candidates will get a good pay scale and intensives as per norms. Candidates applying for the FCI Posts must have to pay an application fee of Rs 500/- through online using any debit/credit cards. Aspirants seeking to apply FCI Posts 2019 can download FCI Notification 2019 PDF and apply for the announced posts from the following links. Candidates have to possess the educational qualification as per the designation. Freshers and experienced candidates can also apply for FCI posts. Age limit of applicants must be in between 18 to 40 years. Age relaxation for reserved category candidates will be offered as per norms. Selection of candidates will be done through preliminary examination, mains examination, and interview rounds. Selected candidates will get a good pay scale and intensives as per norms. Pay scale will be varied from designation to designation. Check the notification for more details. Candidates applying for the FCI Posts must have to pay an application fee of Rs 500/- through online using any debit/credit cards. 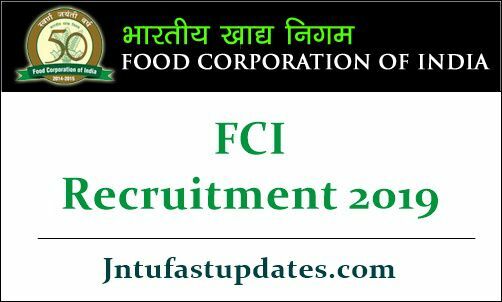 How to Apply for FCI Posts 2019? Interested and eligible aspirants can apply through online at fci.gov.in. The online application form will be available from 23rd February to 30th March 2019. Candidates can apply within the scheduled dates. Late applications will not be accepted.